Cover sheet for the "Dolly" Suite. If you missed the show on Monday and Tuesday, we answered the question of who Dolly is, and listened to a birthday lullaby, and music for a non-cat (listen to Tuesday’s show if you’re not sure what that is). 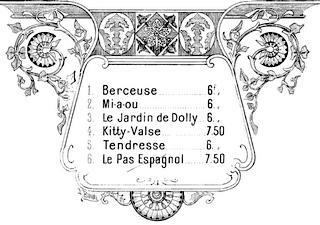 Today, we highlight the third movement, "Le jardin de Dolly." That translates to "Dolly’s Garden." Fauré had composed it as a New Year’s Day present at the start of 1895. Fauré managed to quote one of his own compositions when he was writing it. Of course, after the music we’ll give you the another hint for this week’s Quizlet. Text us the correct answer, and we’ll get you a Kids Commute Prize Pack!